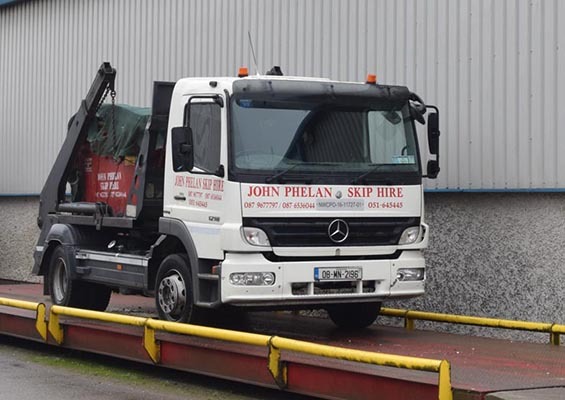 John Phelan Skip Hire is a leading waste management company based in Carrick-on-Suir, Co. Tipperary. The family-run business has been providing the South-East with prompt, professional and competitively-priced skip hire and waste disposal services since 2009. Serving business, commercial and domestic customers in Tipperary, Kilkenny, Waterford and parts of Wexford from a large site at Mill River Business Park in Carrick-on-Suir, John Phelan Skip Hire is run by husband-and-wife John and Kay Phelan along with 12 staff. “The company is committed to providing its clients with a reliable, efficient, courteous and environmentally-friendly waste management service with customer satisfaction its number one priority,”operations manager Paddy McNamara explains. John and Kay set up the business after obtaining a national Waste Collection Permit in 2009, which allows them to collect waste from anywhere in the Republic of Ireland. In 2012, they secured their Waste Facility Permit, which enabled them to open a state-of-the-art waste recycling facility in November of that year. 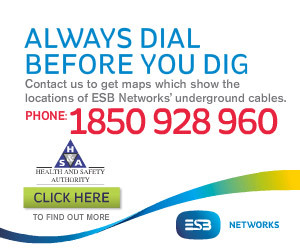 Regulated by Tipperary County Council, the facility recycles waste into separate streams for recycling and disposal. The company’s aim is to recycle as much of the waste as possible. John Phelan Skip Hire supplies the widest range of skips in the South-East, including mini, standard, large, commercial and industrial (Roll-On, Roll-Off). The 4x4x3ft mini skip is suitable for small volume clear-outs from the house or garden, while the 6 cubic yard version is the standard industrial builders’skip which is suitable for work on building sites, home and shop use. The 8 cubic yard skip is ideal for general household or commercial clear-outs, while the 14 cubic yard skip caters for large volumes of light waste, including timber, steel and cardboard. The Roll-On, Roll-Off skip is suitable for large volumes of general C&D and bulky waste. “Our skips range in size from 2.5 cubic yards (mini) up to 40 cubic yards. We have 6, 8, 10, 14, 20 and 30 cubic yard skips in between. There’s something for everyone. The 20 cubic yard skips are in big demand thanks to the recovery in the building sector. For the householder doing a clear-out, sometimes it can work out cheaper to hire the bigger skip,”Paddy continues. The company can make your house clean-up a lot easier by taking care of your unwanted items. Similarly, its commercial and industrial skip hire can assist you with your waste removal in a clean and efficient manner. John Phelan Skip Hire’s flexible hire terms provide customers with extra time to complete their jobs more efficiently. It can remove concrete, soil clay, rubble, bricks, sand and general waste from building sites, while multi-skip delivery and collection is available to ensure there is no downtime on your site. A mattress collection service is also provided. John Phelan Skip Hire boasts a wide and varied client list. “We provide skips on demand –that’s the biggest reason why customers keep coming back to us. But they also choose us because of our friendly, reliable, professional and personal service. We’re on first-name terms with many of our customers and it gives us a feel for what they want. There is contact made with the customer every time a skip goes out on hire. The small client is just as important to us as the big one,”Paddy says. John Phelan Skip Hire operates a modern fleet of seven trucks and three trailers. There are four skip lorries (three Mercedes and one Scania), two hook loaders (Hino and Renault) and one artic (also Renault). The trailers are walking floor, ejector and drag. The vast majority of maintenance and repair work is carried out in-house. With a service that is second to none, John Phelan Hire Skip goes above and beyond to make ordering a skip as easy as possible. Make sure to book your skip today. Opening hours are from 8am to 6pm Monday-Friday and from 8am to 4pm on Saturdays. Mill River Business Park, Carrick-on-Suir, Co. Tipperary.